Steve Bowen’s new book “Total Value Optimization” describes the pressure today’s corporate leaders are under to deliver differentiated, lasting performance—fast. The world is changing rapidly, and Industry 4.0 is driving new business models. Competitors are becoming more numerous, more formidable, and more global, which puts profitability at risk as whole supply chains shift in industries. Steve Bowen’s new book “Total Value Optimization” describes the pressure today’s corporate leaders are under to deliver differentiated, lasting performance—fast. 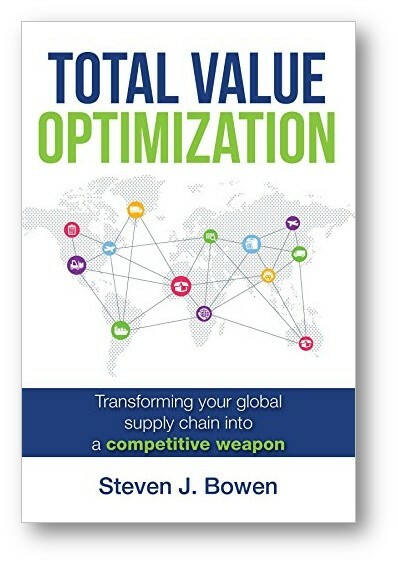 Steve Bowen’s book offers a solid framework for executives in search of an engaging, thoughtful, and comprehensive approach toward achieving supply chain excellence.” -John D. Baumann, President and CEO, Colony Brands, Inc.